History - Interactive center "Be Proud"
Croatian Football Federation (HNS) was founded on June 13th, 1912. Croatian Football Federation (HNS) was founded on 13 June 1912. HNS was first admitted to FIFA in 1941, and later on 3 July 1992, after Croatia gained independence. Admittance to UEFA dates back to 17 June, 1993. Croatian football history dates back to the end of the 19th century, when the English came to Rijeka to build a factory and used their free time to play the first football matches on Croatian soil - although the Croats didn't participate. The English industrialists have afterwards arrived to the Croatian city of Županja. Upon their arrival, they have started to employ local people, and then taught the young citizens of Županja their games, especially football. The English spent their after-work time playing with a small, round, compact leather ball. They passed the ball, kicked it around and soon they explained the rules of the game to the locals and finally left them the ball as a gift. Football continued to be played in Županja, while the first football was found in 1979 in the Vladimir Nazor Street, in a typical border-crossing guardhouse, approximately two centuries old. The ball was made from natural leather with flaps, one of which was missing. The owner inherited the ball from his ancestors, employed by the tannin factory founded by the English. The first book about football, including the game rules, has been printed in Zagreb in 1896. An improved book of rules, along with explanations and guidelines, has been published in 1908. Football has been played by Croats through the gymnastic organization Croatian Falcon, while the first Croatian sports club committed to football was the First Football and Sports Club Zagreb, founded in 1903. Before the World War I, some English teams have visited Zagreb and Croatia, where they have been defeated by the Croatian club HAŠK, and after the World War I, the Split team played several matches against the teams of English battleship sailors, anchored throughout the Adriatic. Professional coaches arrived to Croatia in 1914 to train and lead Croatian teams. At the beginning of the 20th century, when first football clubs were founded in Croatia, football leaders wanted to found a national football federation, but the political circumstances didn't allow it. After the first public football game between HAŠK and PNIŠK, played in Zagreb in front of the University Library in 1906, the Croats developed even bigger desire to establish a national football federation. Three years later, the Croatian Sports Federation was founded. In 1912, the oldest and most prominent football employees in Croatia, Milovan Zoričić, Zvonimir Klobučar, Ivan Pipinić, Hinko Würth, Dragutin Albrecht, and Branko Gavella, took over the stage to develop and improve football in Croatia. They can therefore be considered as some of the first members of the newly founded Croatian Football Federation. Croatia national team played its first international matches back in 1907 in Prague against Slavia. HNS continued its work during the World War I and II, including the struggle for equality within the Yugoslav Football Federation. Thus, Croatia participated in a joint football history within the former Yugoslavia, and numerous Croatian teams participated in the European Cup/Champions League and other UEFA competitions, while Croatian players participated in European Championships and World Cups in Yugoslav colours. Among the top goalscorers of the 1960 UEFA EURO and 1962 FIFA World Cup was Croatia striker Dražan Jerković, while Josip Skoblar won a Golden Boot as a Olympique Marseille player in 1970/71. With the establishment of the sovereign, independent and democratic Republic of Croatia in early 1990s, Croatian football also became independent and the HNS started to work on further development of the most popular sport in the country and the world. Croatia was admitted to FIFA in 1992, although a first admission dates back in 1941, while in 1993 Croatia was admitted to UEFA. The first modern official Croatian international match was an October 1990 friendly between Croatia and USA, played at Maksimir Stadium in Zagreb. Afterwards, Croatia was successful in the EURO 1996 qualifying, and later secured the quarterfinal stage. 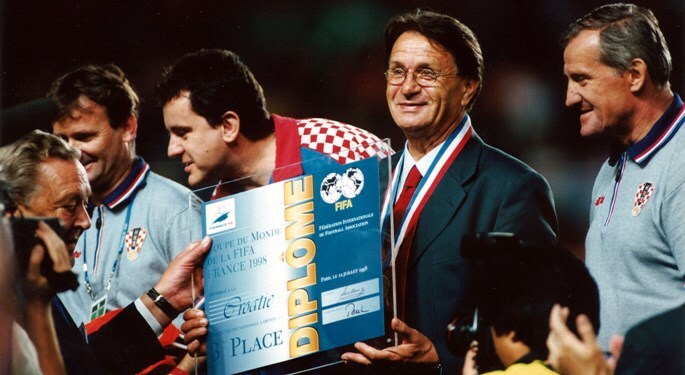 Two years later, at the FIFA World Cup in France, the national team achieved the first great result in Croatian football history, winning the bronze medal. At the same tournament, Croatia striker Davor Šuker, the current president of HNS, was the top goalscorer with six goals and has therefore won the Golden Boot award. Additionally, Šuker is the top Croatian goalscorer in history with 45 goals (69 caps). At the 2018 FIFA World Cup Russia, generation led by head coach Zlatko Dalić managed to surpass the "bronze" generation by winnings its way into the World Cup final where it lost against France 4:2. Silver medalists were given a hero's welcome by more than 500.000 fans in Zagreb. After his stellar play during the tournament, captain Luka Modrić was awarded the Golden Ball for the best player of the tournament. Croatia was close to semifinals at the 2008 UEFA EURO, and HNS is extremely proud of successful work in youth categories. Moreover, Croatia was a praised host of the 2017 European Championships U-17. The greats such as Šuker, Boban, Prosinečki, Bilić and others, under the head coach Blažević, has paved the way for the successors, who used the opportunity to leave a mark in the best European clubs. Current captain Modrić has won four Champions League titles with Real Madrid, while Mandžukić scored twice in the finals, for Bayern and Juventus. The names of former captain Srna, Rakitić, Pršo, Kovač brothers, Olić, and other remain among the best Croatian ambassadors in the world. Furthermore, they remain a permanent confirmation of the quality efforts of the Croatian Football Federation.